Have not changed principles in hundreds of years. Still just a prosthesis that looks like teeth that floats on gum tissue. Move, slip, rub and fall out. Accelerate bone and gum tissue loss. Prone to falling out during speech, laughter and eating. Implants are anchored in the jawbone. Denture will snap over the implant locking the denture in place. Implants will preserve the jawbone. Increased self-confidence due to extreme stability of implant denture. Pasadena Texas Cosmetic Dentist Michael Nugent is a regional leader in dental implants. With a minimum of two dental implants, Dr. Nugent can create advanced dental implant dentures that are stable. 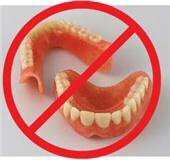 If you are currently wearing old fashioned dentures Dr. Nugent can retrofit them implant dentures. If you have old fashioned dentures or are about to go into dentures watch this jaw-dropping and stunning video about dental implant dentures. You deserve the best in denture care. We encourage you to call our office and discover why Dr. Nugent is known as THE PASADENA TEXAS DENTIST. The local newspaper has twice voted him BEST PASADENA TEXAS DENTIST. Our amazing dental office is located at 3421 Burke Rd Ste A, Pasadena, Texas 77504. Come see how implant dentures can change your life. Call us today at 713-841-8261 to schedule your appointment today.